Tron [TRX] is now among the top 10 cryptocurrencies according to CoinMarketCap and has shown a hike of 0.26% in the last 24-hours. TRX has grown by 12% in the last seven days, while the major cryptocurrency is being pinned down by the bear. According to CoinMarketCap, Tron was trading at $0.0145 with a market cap of $959 million and a 24-hour trade volume of $76 million. The coin registered a downtrend from $0.0164 to $0.0151, which further slipped till $0.01453. 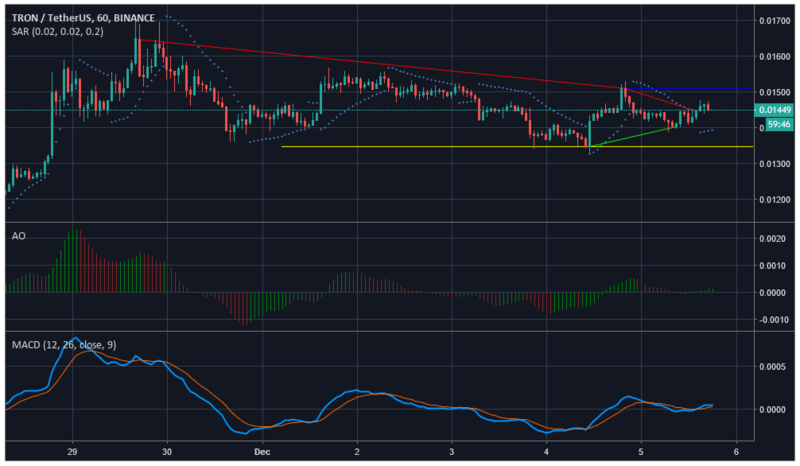 TRX also showed a miniscule uptrend from $0.0134 to $0.0140. There was an immediate resistance offered to the coin at $0.0151, while a strong support was registered at $0.0134. Parabolic SAR indicates a bullish market as the markers are under the candles. Awesome Oscillator too is in line with the aforementioned indicator and marks a bullish market. MACD points toward a green market as the moving average line has taken a bullish curve. The coin showed a downtrend from $0.0390 to $0.0247. An uptrend was noticed from $0.0120 to $0.0137. The coin faced an immediate resistance at $0.0157, whereas a strong support was offered at $0.0119. Bollinger Bands hints towards a volatile market which means the prices might fluctuate but is slowly converging. Chaikin Money Flow indicator is below the 0-line, unlike others, marks a bearish market as the money is flowing out of the market. Relative Strength Index is indicating that the buying and selling pressure are evening each other out. 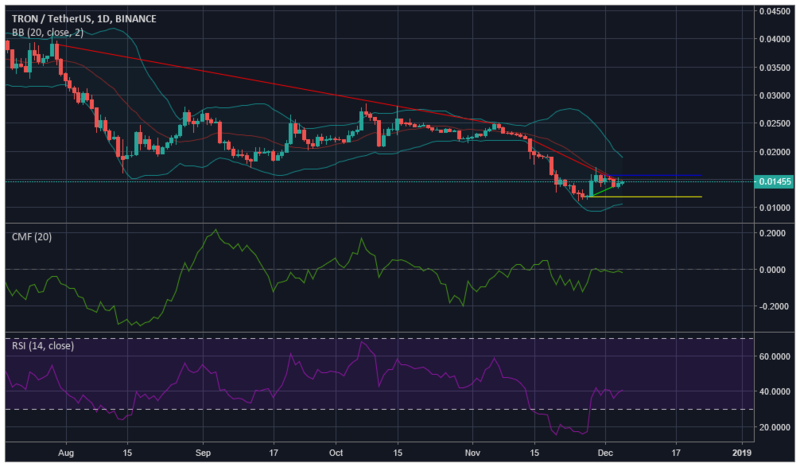 Tron has shown a steady growth in the past week and it looks like it will no longer be dragged by the bear as indicated by Parabolic SAR and MACD. However, the bear still seems to linger, as indicated by CMF. TRON Price Sinks 17.5% In Three Days: Is Justin Sun a Marketing Genius?